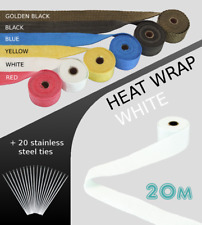 HEAT WRAP with ties - BLACK - 25M. THIS IS SUITABLE FOR WRAPPING CAR EXHAUST SYSTEMS AND MOTORBIKE SYSTEMS. Heat Wrap is used to keep heat in, and away from, the engine bay. The colder the engine bay, the better your engine will perform. HEAT WRAP - WHITE - 20M. THIS IS SUITABLE FOR WRAPPING CAR EXHAUST SYSTEMS AND MOTORBIKE SYSTEMS. Heat Wrap is used to keep heat in, and away from, the engine bay. The colder the engine bay, the better your engine will perform. HEAT WRAP with ties - RED - 15M. THIS IS SUITABLE FOR WRAPPING CAR EXHAUST SYSTEMS AND MOTORBIKE SYSTEMS. Heat Wrap is used to keep heat in, and away from, the engine bay. The colder the engine bay, the better your engine will perform. 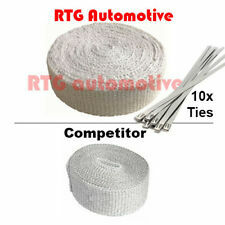 HEAT WRAP with ties - WHITE - 15M. THIS IS SUITABLE FOR WRAPPING CAR EXHAUST SYSTEMS AND MOTORBIKE SYSTEMS. Heat Wrap is used to keep heat in, and away from, the engine bay. The colder the engine bay, the better your engine will perform. HEAT WRAP with ties - YELLOW - 15M. THIS IS SUITABLE FOR WRAPPING CAR EXHAUST SYSTEMS AND MOTORBIKE SYSTEMS. Heat Wrap is used to keep heat in, and away from, the engine bay. The colder the engine bay, the better your engine will perform. 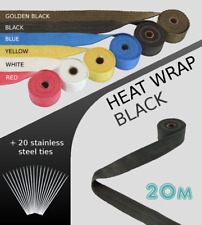 HEAT WRAP with ties - BLACK - 20M. THIS IS SUITABLE FOR WRAPPING CAR EXHAUST SYSTEMS AND MOTORBIKE SYSTEMS. Heat Wrap is used to keep heat in, and away from, the engine bay. The colder the engine bay, the better your engine will perform. THIS IS SUITABLE FOR WRAPPING CAR EXHAUST SYSTEMS AND MOTORBIKE SYSTEMS. HEAT WRAP with ties - WHITE - 10M. Heat Wrap is used to keep heat in, and away from, the engine bay. The colder the engine bay, the better your engine will perform. THIS IS SUITABLE FOR WRAPPING CAR EXHAUST SYSTEMS AND MOTORBIKE SYSTEMS. HEAT WRAP with ties - RED - 5M. Heat Wrap is used to keep heat in, and away from, the engine bay. The colder the engine bay, the better your engine will perform. THIS IS SUITABLE FOR WRAPPING CAR EXHAUST SYSTEMS AND MOTORBIKE SYSTEMS. HEAT WRAP with ties - YELLOW - 10M. Heat Wrap is used to keep heat in, and away from, the engine bay. The colder the engine bay, the better your engine will perform. THIS IS SUITABLE FOR WRAPPING CAR EXHAUST SYSTEMS AND MOTORBIKE SYSTEMS. HEAT WRAP with ties - RED - 10M. Heat Wrap is used to keep heat in, and away from, the engine bay. The colder the engine bay, the better your engine will perform. Labour claims are never accepted. 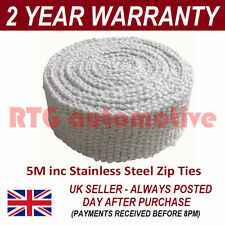 2” (50mm) wide Thick Heavy Duty ceramic exhaust heat wrap suitable for cars, motorcycles and other applications including exhaust manifolds, exhaust pipes and silencer boxes. 2PCS WHEEL ARCH GUARD TRIM / WHEEL ARCH PROTECTOR UNIVERSAL SOFT RUBBER BLACK. 1 X 89mm Carbon Fiber Exhaust muffler tip. Car Interior Air Outlet Armrest Box Dashboard Dust Hairs Green Cleaning Gel Glue. Any information in the compatibility table is for reference only and there may be unspecified choice options. Labour claims & consequential loss claims are never accepted. 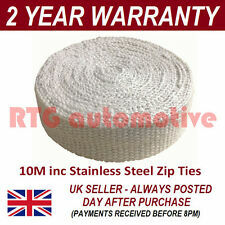 2” (50mm) wide Thick Heavy Duty ceramic exhaust heat wrap suitable for cars, motorcycles and other applications including exhaust manifolds, exhaust pipes and silencer boxes. Type: Resistance Muffler. Makes the pipe seems to spit fire! Manufacturer Part Number: Car Exhaust. Mounting Position: Rear. Material Type: Stainless steel. Universal suit for the straight pipe. Country/Region of Car Manufacture: China.